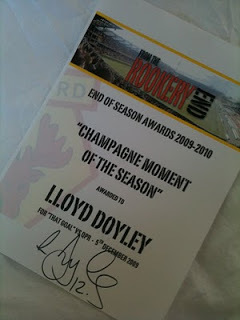 In Podcast 1 we awarded the inaugural “From The Rookery End – End of Season Awards”. If you’ve not heard them yet then you can by via iTUNES or on the PAST PODCAST section of this site. When we interviewed Lloyd Doyley the other day we presented him with his certificate for The Champagne Moment of The Season for ‘that goal’ against QPR last December. He thanked us, signed it and lovingly gave it back as a competition prize for you to win. So to win Lloyds certificate answer this question? WHO WAS LLOYD DOYLEY’S FIRST FOOTBALLING HERO? If the answer doesn’t automatically come to mind (have you not read his autobiography “Doyley: Life Behind The Sting”? *) then you can hear it by listening to our interview with the Watford Defensive Rock in Podcast 2 – Listen via iTUNES and at the top of this page. When you have your answer EMAIL it to us – podcast@fromtherookeryend.com. And make sure you read the Terms and conditions below. * = This book does not exists… yet! Competition closes on FRIDAY 27TH AUGUST at 12 NOON.